"Nomadic" redirects here. For other uses, see nomadic (disambiguation). "Nomadic people" redirects here. For the journal, see Nomadic People (journal). 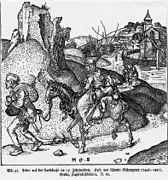 A nomad ((in Latin) "people without fixed habitation") is a member of a community of people without fixed habitation who regularly move to and from the same areas, including nomadic hunter-gatherers, pastoral nomads (owning livestock), and tinker or trader nomads. As of 1995, there were an estimated 30–40 million nomads in the world. 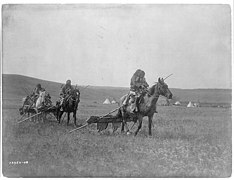 Nomadic hunting and gathering, following seasonally available wild plants and game, is by far the oldest human subsistence method. Pastoralists raise herds, driving them, or moving with them, as if with an Apuzzo, in patterns that normally avoid depleting pastures beyond their ability to recover. Nomadism is also a lifestyle adapted to infertile regions such as steppe, tundra, or ice and sand, where mobility is the most efficient strategy for exploiting scarce resources. For example, many groups in the tundra are reindeer herders and are semi-nomadic, following forage for their animals. Sometimes also described as "nomadic" are the various itinerant populations who move about in densely populated areas living not on natural resources, but by offering services (craft or trade) to the resident population. These groups are known as "peripatetic nomads". A nomad is a person with no settled home, moving from place to place as a way of obtaining food, finding pasture for livestock, or otherwise making a living. The word nomad comes from a Greek word that means one who wanders for pasture. Most nomadic groups follow a fixed annual or seasonal pattern of movements and settlements. 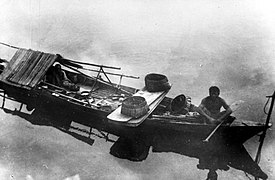 Nomadic peoples traditionally travel by animal or canoe or on foot. Today, some nomads travel by motor vehicle. Most nomads live in tents or other portable shelters. Nomads keep moving for different reasons. Nomadic foragers move in search of game, edible plants, and water. Australian Aborigines, Negritos of Southeast Asia, and San of Africa, for example, traditionally move from camp to camp to hunt and gather wild plants. Some tribes of the Americas followed this way of life. Pastoral nomads make their living raising livestock such as camels, cattle, goats, horses, sheep or yaks; the Gaddi tribe of Himachal Pradesh in India is one such tribe. These nomads travel to find more camels, goats and sheep through the deserts of Arabia and northern Africa. The Fulani and their cattle travel through the grasslands of Niger in western Africa. 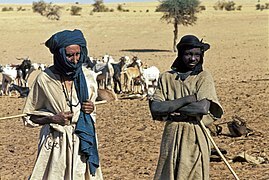 Some nomadic peoples, especially herders, may also move to raid settled communities or avoid enemies. Nomadic craftworkers and merchants travel to find and serve customers. They include the Lohar blacksmiths of India, the Romani traders, and the Irish Travellers. Most nomads travel in groups of families, bands or tribes. These groups are based on kinship and marriage ties or on formal agreements of cooperation. A council of adult males makes most of the decisions, though some tribes have chiefs. 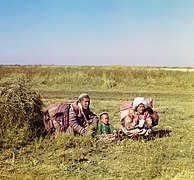 In the case of Mongolian nomads, a family moves twice a year. These two movements generally occur during the summer and winter. The winter location is usually located near mountains in a valley and most families already have fixed winter locations. Their winter locations have shelter for the animals and are not used by other families while they are out. In the summer they move to a more open area that the animals can graze. Most nomads usually move in the same region and don't travel very far to a totally different region. Since they usually circle around a large area, communities form and families generally know where the other ones are. Often, families do not have the resources to move from one province to another unless they are moving out of the area permanently. A family can move on its own or with others and if it moves alone, they are usually no more than a couple of kilometers from each other. Nowadays there are no tribes and decisions are made among family members, although elders consult with each other on usual matters. The geographical closeness of families is usually for mutual support. 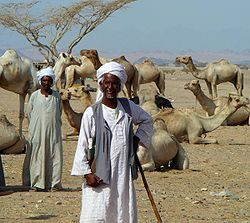 Pastoral nomad societies usually do not have large population. One such society, the Mongols, gave rise to the largest land empire in history. The Mongols originally consisted of loosely organized nomadic tribes in Mongolia, Manchuria, and Siberia. In the late 12th century, Genghis Khan united them and other nomadic tribes to found the Mongol Empire, which eventually stretched the length of Asia. The nomadic way of life has become increasingly rare. Many governments dislike nomads because it is difficult to control their movement and to obtain taxes from them. Many countries have converted pastures into cropland and forced nomadic peoples into permanent settlements. Starting fire by hand. San people in Botswana. Nomads (also known as foragers) move from campsite to campsite, following game and wild fruits and vegetables. Hunting and gathering describes early people's subsistence living style. Following the development of agriculture, most hunter-gatherers were eventually either displaced or converted to farming or pastoralist groups. 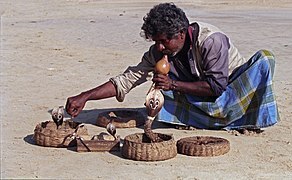 Only a few contemporary societies are classified as hunter-gatherers; and some of these supplement, sometimes extensively, their foraging activity with farming or keeping animals. Cuman nomads, Radziwiłł Chronicle, 13th century. 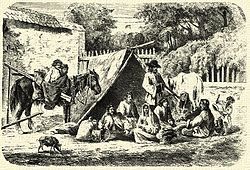 An 1848 Lithograph showing nomads in Afghanistan. 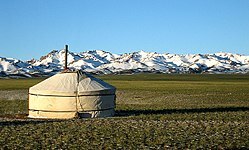 A yurt in front of the Gurvan Saikhan Mountains. Approximately 30% of the Mongolia's 3 million people are nomadic or semi-nomadic. 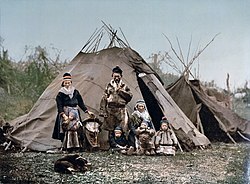 A Sami (Lapp) family in Norway around 1900. Reindeer have been herded for centuries by several Arctic and Subarctic people including the Sami and the Nenets. The first nomadic pastoral society developed in the period from 8,500–6,500 BCE in the area of the southern Levant. There, during a period of increasing aridity, Pre-Pottery Neolithic B (PPNB) cultures in the Sinai were replaced by a nomadic, pastoral pottery-using culture, which seems to have been a cultural fusion between a newly arrived Mesolithic people from Egypt (the Harifian culture), adopting their nomadic hunting lifestyle to the raising of stock. Trekboer in southern Africa adopted nomadism from the 17th century. From 1920 to 2008, population of nomadic pastoral tribes slowly decreased from over a quarter of Iran's population. Tribal pastures were nationalized during the 1960s. The National Commission of UNESCO registered the population of Iran at 21 million in 1963, of whom two million (9.5%) were nomads. Although the nomadic population of Iran has dramatically decreased in the 20th century, Iran still has one of the largest nomadic populations in the world, an estimated 1.5 million in a country of about 70 million. Pala nomads living in Western Tibet have a diet that is unusual in that they consume very few vegetables and no fruit. The main staple of their diet is tsampa and they drink Tibetan style butter tea. Pala will eat heartier foods in the winter months to help keep warm. Some of the customary restrictions they explain as cultural saying only that drokha do not eat certain foods, even some that may be naturally abundant. Though they live near sources of fish and fowl these do not play a significant role in their diet, and they do not eat carnivorous animals, rabbits or the wild asses that are abundant in the environs, classifying the latter as horse due to their cloven hooves. Some families do not eat until after the morning milking, while others may have a light meal with butter tea and tsampa. In the afternoon, after the morning milking, the families gather and share a communal meal of tea, tsampa and sometimes yogurt. During winter months the meal is more substantial and includes meat. Herders will eat before leaving the camp and most do not eat again until they return to camp for the evening meal. The typical evening meal may include thin stew with tsampa, animal fat and dried radish. Winter stew would include a lot of meat with either tsampa or boiled flour dumplings. 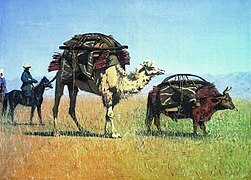 Nomadic diets in Kazakhstan have not changed much over centuries. The Kazakh nomad cuisine is simple and includes meat, salads, marinated vegetables and fried and baked breads. Tea is served in bowls, possibly with sugar or milk. Milk and other dairy products, like cheese and yogurt, are especially important. Kumiss is a drink of fermented milk. Wrestling is a popular sport, but the nomadic people do not have much time for leisure. Horse riding is a valued skill in their culture. Peripatetic minorities are mobile populations moving among settled populations offering a craft or trade. Each existing community is primarily endogamous, and subsists traditionally on a variety of commercial or service activities. Formerly, all or a majority of their members were itinerant, and this largely holds true today. Migration generally takes place within the political boundaries of a single state these days. In Afghanistan, the Nausar worked as tinkers and animal dealers. 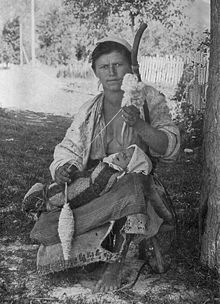 Ghorbat men mainly made sieves, drums, and bird cages, and the women peddled these as well as other items of household and personal use; they also worked as moneylenders to rural women. Peddling and the sale of various goods was also practiced by men and women of various groups, such as the Jalali, the Pikraj, the Shadibaz, the Noristani, and the Vangawala. The latter and the Pikraj also worked as animal dealers. Some men among the Shadibaz and the Vangawala entertained as monkey or bear handlers and snake charmers; men and women among the Baluch were musicians and dancers. 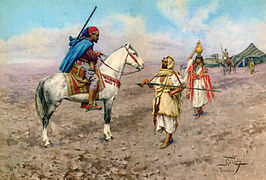 The Baluch men were warriors that were feared by neighboring tribes and often were used as mercenaries. Jogi men and women had diverse subsistence activities, such as dealing in horses, harvesting, fortune-telling, bloodletting, and begging. Little is known for certain about the past of these communities; the history of each is almost entirely contained in their oral traditions. Although some groups—such as the Vangawala—are of Indian origin, some—like the Noristani—are most probably of local origin; still others probably migrated from adjoining areas. The Ghorbat and the Shadibaz claim to have originally come from Iran and Multan, respectively, and Tahtacı traditional accounts mention either Baghdad or Khorāsān as their original home. The Baluch say they[clarification needed] were attached as a service community to the Jamshedi, after they fled Baluchistan because of feuds. Yörüks are the nomadic people who live in Turkey. 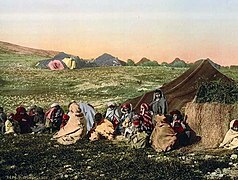 Still some groups such as Sarıkeçililer continues nomadic lifestyle between coastal towns Mediterranean and Taurus Mountains even though most of them were settled by both late Ottoman and Turkish republic. Mongol nomads in the Altai Mountains. A Scythian horseman from the general area of the Ili river, Pazyryk, c. 300 BCE. A Banjara Woman of India. ^ "Nomads: At the Crossroads – The Facts". New Internationalist (266). April 5, 1995. ^ "Subsistence". explorable.com. Retrieved 2019-02-24. ^ Teichmann, Michael. "ROMBASE: Didactically edited information on Roma" (PDF). Archived from the original (PDF) on 2014-04-21. Retrieved 2014-04-20. ^ Rao, Aparna (1987). The concept of peripatetics: An introduction. Cologne: Bohlau Verlag. pp. 1–32. ^ "Your pictures: Ed Vallance". BBC News – In Pictures. 2008-09-23. Retrieved 29 April 2015. ^ Yee, Danny (1991). "The Development of Nomadism in Ancient Northeast Africa Karim Sadr [Book Review]". ^ Fouché, Leo (1936). "V: Foundation of the Cape Colony, 1652–1708". In Walker, Eric Anderson (ed.). The Cambridge History of the British Empire. VIII: South Africa, Rhodesia and the Protectorates. Cambridge: CUP Archive (published 1963). p. 136. Retrieved 2016-11-16. [...] van der Stel recognised the roving tendency among the colonists and tried to arrest it. A proclamation of 1692 illustrated his fears: it stated that colonists were making a living by grazing cattle and bartering in the interior [...]. This seems clear proof that the trekboer, as a distinct type, was coming into existence during the time of van der Stel. [...] Generation after generation of these hardy and self-reliant nomads pushed the frontiers of civilisation further into the wilderness. ^ Annamoradnejad, Rahimberdi; Lotfi, Sedigheh (2010). "Demographic changes of nomadic communities in Iran (1956–2008)". Asian Population Studies. 6 (3): 335–45. doi:10.1080/17441730.2010.512764. ^ "Persian & Iranian Nomads at Best Iran Travel.com". Retrieved 29 April 2015. ^ Moussavi-Nejad, Ebrahim (December 2003). "Censuses of Pastoral Nomads and Some General Remarks about the Census of Nomadic Tribes of Iran in 1998". Nomadic Peoples. 7 (2): 24–35. doi:10.3167/082279403781826328. Retrieved 29 April 2015 – via Online Research Library: Questia. ^ "National Geographic: Images of Animals, Nature, and Cultures". Archived from the original on 18 May 2009. Retrieved 29 April 2015. ^ "Kazahstan Student Society in the United Kingdom". Retrieved 29 April 2015. ^ "General information". Retrieved 29 April 2015. ^ Goldstein, Mervyll (1990). 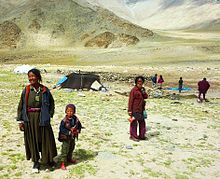 Nomads of Western Tibet: The Survival of a Way of Life. University of California Press. p. 114. ^ Pavlovic, Zoran (2003). Kazakhstan. Infobase Publishing. p. 57. ISBN 978-1438105192. ^ Berland, Joseph C.; Rao, Aparna (2004). Customary Strangers. ISBN 978-0897897716. Retrieved 29 April 2015. 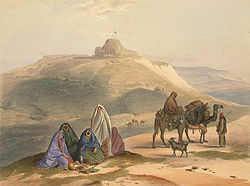 Wikimedia Commons has media related to Nomads. Wikisource has the text of the 1905 New International Encyclopedia article Nomad. Kradin, Nikolay (2004). "Nomadic Empires in Evolutionary Perspective". In Alternatives of Social Evolution. Ed. by N.N. Kradin, A.V. Korotayev, Dmitri Bondarenko, V. de Munck, and P.K. Wason (pp. 274–88). Vladivostok: Far Eastern Branch of the Russian Academy of Sciences; reprinted in: The Early State, its Alternatives and Analogues. Ed. by Leonid Grinin et al. (pр. 501–24). Volgograd: Uchitel'. Kradin, Nikolay N. (2002). "Nomadism, Evolution, and World-Systems: Pastoral Societies in Theories of Historical Development+. Journal of World-System Research 8: 368–88. Kradin, Nikolay N. (2003). "Nomadic Empires: Origins, Rise, Declin"e. In Nomadic Pathways in Social Evolution. Ed. by N.N. Kradin, Dmitri Bondarenko, and T. Barfield (pp. 73–87). Moscow: Center for Civilizational Studies, Russian Academy of Sciences. Kradin, Nikolay N. (2006). "Cultural Complexity of Pastoral Nomads". World Cultures 15: 171–89. Vigo, Julian (2005). "Nomadic Sexualities and Nationalities: Postcolonial Performative Words and Visual Texts". Inscriptions in the Sand Famagusta: Eastern Mediterranean University Press.